You may not immediately associate the term ‘bathroom’ with the word ‘furniture’, since people tend to focus on the big fittings like the bath and the shower when it’s mentioned. But this room does have furnishings, and they are important in the overall design scheme. Many small bathrooms only have a small cabinet, under the sink or on the wall, but these items take up a noticeable portion of surface space, and draw the attention of the viewer. When you’re making renovations, redecorating or building from scratch, don’t forget the furniture. Choosing units with the right look, colour scheme and fittings is important when completing the room’s design. A creaky old cupboard painted in the wrong colours will stick out painfully once the rest of the room is revamped. While you’re changing items like baths and tiles, you should try to leave room in that budget for a new furniture set, too. These items can be worked into a budget easily if you shop around. Try browsing some online stores, where even designer units can be remarkably cheap. There are several kinds of furniture out there, which may provide some inspiration for your bath room design. You aren’t limited to the standard cupboard, and can really perfect a new look for the room with the right unit. Tall cabinet. As the name implies, these tall units are ideal for rooms with limited floor space. They can come with multiple compartments. Wall cupboard. Fitted onto the wall, these are also useful for small rooms, or for storing items within easy reach. Just make sure that the wall section doesn’t house any pipes. Side cabinet. These freestanding units are great for storing things that you don’t grab regularly, like backup stocks of shampoo and loo roll. Vanity unit. This is a sink with a cupboard built underneath, very useful for all those little accoutrements, vanity sets, toiletries, etc. Console. This is a sink inset onto a wider surface hollowed underneath, which has a striking, table-like look and offers plenty of room. These are just a few of the unit types you’ll find when browsing for your new room design. The selection of contemporary, feature-packed units available may surprise you, even in modest price ranges. When the time comes for you to buy new fittings, a little patience and effort browsing the Internet will always uncover some discount treasures. So long as you plan your design in advance, with some consideration for budgeting and accurately measuring your space for installation, you can minimise the cost of a beautiful new bathroom. There are several furniture suppliers that offer both designer appeal and value, like Villeroy & Boch, Ideal Standard, Duravit and Keuco, among others. Villeroy & Boch, in particular, produce a vast selection of contemporary units, including the Subway range in a clean and appealing slate colour. 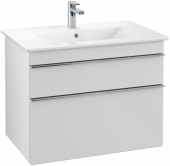 The Hommage series, also from Villeroy & Boch, includes a classic vanity cupboard in hard wood and with glass doors. Duravit produce the Starck range, which has another type of wooden vanity that’s cone-shaped and reminiscent of a tropical hideaway. 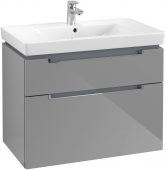 Duravit’s PuraVida range has some more typical alternatives, with sleek aluminium cabinets built in. 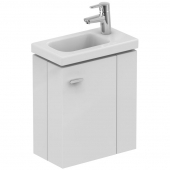 Keramag have a very practical corner washbasin cabinet, part of the Renova series, which would be ideal for smaller rooms. Also consider the 4U range by Keramag for cube-shaped, contemporary units that give the room a futuristic feel. For something a little different, Alape have the Hochschrank range, including some tall units with a variety of wood finishes. 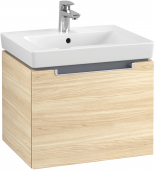 Alape’s Konsol-Auszug under-sink units also feature veneer, sleek and sliding drawers. Keuco’s Edition 400 range is a great choice for those seeking very sleek and seamless design that incorporates glass into clean white units. The Roval Modular range, also from Keuco, continues the minimalist theme and has several shapes and sizes of wall mounted cupboards. For some other contemporary options, the furniture made by Ideal Standard is perfect. 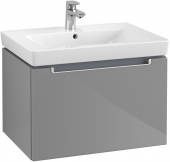 The Ideal Standard Strada range features some high-gloss washbasin units with chrome handles. Lastly, consider Aquaris if you prefer hardwearing mineral marble and stone. Whatever furnishing choices you go with, remember than cupboards must complement the colour scheme and style of the room as a whole. With a little planning and budgeting, achieving the perfect combination is easy.